Livestock play an important role in Ethiopia's economy. Sale of livestock is the second largest earner of foreign exchange in Ethiopia after coffee. The sector contributes more than 15% of Gross Domestic Product (GDP) and up to 49% of gross agricultural production (Gelayenew et al., 2016). The Ethiopian livestock sector has considerable economic and social importance, at both household and national levels. Livestock production is a year round activity, in comparison to crop production (which is seasonal) and therefore serves as security against the risk of crop failure while providing year-round employment to a huge workforce. It contributes in different proportions to household incomes, varying from 37% in the livelihoods of smallholder farmers in the mixed farming system to 87% in pastoralist communities (Gebremariam et al., 2010; Behnke and Metaferia, 2011; ATA, 2012). Ethiopia’s livestock population is the largest in Africa. It is estimated to boast 56.71 million cattle, 29.33 million sheep, 29.11 million goats, 56.87 million poultry, 2.03 million horses, 7.43 million donkeys, 0.4 million mules, 1.16 million camels and 5.89 million beehives (CSA, 2015). However, the efficiency of livestock production is limited due to a number of constraints, including poor husbandry practices, poor nutrition, low genetic potential and inadequate veterinary services (Ministry of Agriculture and Rural Development [MoARD], 2004). Three main livestock production systems exist across Ethiopia. These are the low-input extensive pastoral system, the semi-intensive mixed crop-livestock system and the intensive livestock production system. Traditionally, the pastoral systems were developed to exploit the moisture deficit of arid and semi-arid agro-ecological zones, characterized by low or no-crop production culture. Therefore, agro-ecological conditions of different areas of the country determine the type of crop and animal production pursued by rural populations. The system of integrated crop and livestock production is an ancient tradition in the mid and highland parts of the country where communal use of grazing lands and crop residues and stubbles is a norm. Mixed crop-livestock farming in Ethiopia is predominantly practiced in places located above 1,500 metres above mean sea level (msl) and the annual rainfall is higher than 700 mm. Crop production extends to altitudes up to 3,300 m msl. Most crops are sown during the main rainy season (meher) that occurs between June and October. From February to May, the crop growing highland parts of the country receive the short rains (belg). Crops grown during the belg season account for one-third of national crop production. In recent years, the short rains have become unreliable which has had huge implications on the food and feed security across many parts of the country. 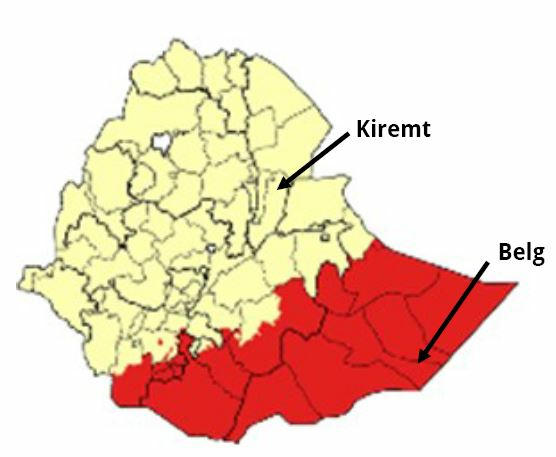 Kiremt dominant means 50% or more of total annual rainfall in the second half of the year (i.e. from June - 19 december). Some of the most important changes occurring in Ethiopia include the continued decline in landholding driven by rapid population growth, encroachment of cropping land onto erstwhile grazing areas and onto less fertile and more easily erodible lands. Furthermore, increasingly degraded land can no longer support reasonable crop and/or livestock production. These impacts have inherent feedback loops which compound one another’s effects and are a high risk to the improvement of living standards within the country (Kimball, 2011). Ranching is an alternative pastoral practice, with the main difference that the former focuses on private land holding aiming at maximizing livestock productivity and return to investment, whilst the primary objective of a pastoral system is to provide food for the family (Malede and Takele, 2014). In the ranching system, animals are grazed on a confined area. Therefore, in this system the stocking rate has to be adjusted to the carrying capacity of limited areas of land, whilst the pastoral system relies on opportunistic utilization of the grazing resources that varies in space and time (Malede and Takele, 2014). The intensive system is one in which the livestock are fed in confinement with limited access to free grazing areas. The system is based on providing animals with high quality feed and much more labour from the livestock keeper is invested as compared to other systems (Damron, 2006). Urban and peri-urban production systems are developed in areas where the population density is high and agricultural land is shrinking due to urbanization around big cities like Addis Ababa and other regional towns (Yitbarek and Berhane, 2014). In this system, crossbred cattle (ranging from F1 to a higher blood level of exotic breeds) - mainly Holstein Friesian and Jersey - are kept in small to medium-sized farms. Urban and peri-urban production systems include commercial to smallholder dairy farms and feedlots. However, not all intensive systems are fully commercial operations; sometimes landless livestock production is carried out with the only purpose to sell a part of the product. According to data presented on Ethiopian Livestock sector during a side event of the 22nd Conference of the Parties (COP 22) to the UN Framework Convention on Climate Change (UNFCCC) (Eshedu and Opio, 2016), the share of dairy production to the overall livestock production is small, and that of the medium scale intensive system to the overall livestock production is between 1% and 3% (Payne and Wilson, 1999). As stated above, poor animal nutrition as a result of inadequate supply of good quality feed, critically limits the efficiency of livestock production and reproduction, and the economic benefits derived from livestock based operations. Livestock feed and feeding systems are constrained by a host of interconnected factors including recurrent droughts, grassland degradation, overgrazing, land tenure and land use changes, resource use conflicts, encroachment of invasive plant species, soil infertility and lack of inputs and planting material, among others. In Ethiopia, the main sources of animal feed are natural pastures, crop residues and agro-industrial by-products. The total area of grazing and browse is estimated to be between 61 and 65 million ha, of which 12% is utilized for mixed farming and the rest are pastoral areas (Malede and Takele 2014). The seasonality of production greatly affects the availability of feed supplies, a common production problem in most Ethiopian livestock feeding systems. In most areas, the supply of fodder increases during the rainy season. Due to a limited culture of feed conservation, the excess wet season fodder, which otherwise could be used to even out the extreme dry season feed deficit, is largely wasted or misused. In the lowlands, herders largely depend on range forage to maintain the lives and productivity of their animals. In agro-pastoral settings, crop residues compliment range forage during specific periods. Stovers (leaves and stalks) of maize and sorghum, and the haulms (stems) of pulse crops are among the feed sources derived from opportunistic crop production system. The contribution of grazing land to animals’ energy and protein needs is difficult to ascertain without the availability of comprehensive information on feed availability, feed use, livestock numbers and their herd structure. It is known that communal grazing land is frequently poor in quality which leads to insufficiency from a nutritional point of view of the feed available from such sources. Crop residue is the most important source of feeding, after pasture. However, crop residues, mainly cereal stalks, are of low quality and digestibility because of the low nutrient density and high fibre content. Sole dependence on such feeds contributes to malnutrition and decreased livestock productivity, resulting also in increased susceptibility to diseases. The seasonal feed shortage and the inefficient feed utilization are the major challenges affecting livestock productivity (Gelayenew et al., 2016). In addition, poor conservation practices, and a lack of knowledge on appropriate feed and feeding practices are among the critical constraints for efficient utilization of available feed resources. During the cropping season, farmers face competing demands on their labour and consequently ‘ideal’ conservation practices for hay are not often used. Development and adoption of labour-saving technologies for crop production could result in additional labour for fodder conservation, in turn improving livestock production. For example, farmers usually stack all cereal straw near their homestead after threshing, selling only a portion of the produce to meet their household’s immediate need for cash. The quantity and the quality of the available feed resources can be improved by strategies such as pasture rehabilitation, biodiversity conservation, integration of pasture and forage into the farming system, utilization of irrigation and improved grazing land management practices. Physical treatments such as soaking, chopping and chemical treatments, such as ammoniation and urea treatment, could also be used to improve availability of nutrients from poor quality roughage. For detailed information about available feed and feeding technologies to sustainably improve livestock production in Ethiopia, see Makkar et al. (2018). In order to better monitor the national and regional livestock sectors and formulate adequate development strategies, it is essential to develop systematic approaches to accurately assess livestock feed supplies and obtain better insight into how feed resources are being utilized. This can be achieved by characterizing feeding systems (Food and Agriculture Organization of the United Nations [FAO], 2012). Accurate estimations of feed resource availability and feed use will also improve assessments of the environmental impacts of livestock, not only through land use transformations but also through greenhouse gas (GHG) emissions associated with livestock production (IPCC, 2006; FAO, 2013). In November 2017, FAO Ethiopia organized a two-day workshop in Addis Ababa which focused on: a) sharing of the conceptual framework and global experiences on sustainable feed production, b) prioritization of emergency feeding strategies for dry areas of Ethiopia (see Makkar et al., 2018), c) expansion of feed resources for use during normal times and in period of feed crises, d) promotion of feed processing and densifying technologies and e) the characterization of feeding systems in lowlands of Ethiopia, with the aim to generate baseline information so that the feeding systems could be manipulated to enhance their efficiency. Such information also assists in building national or regional level GHG inventories. The data on digestibility of feed and feed constituents throughout various seasons is a prerequisite for estimation of GHG emissions from the livestock production systems using IPCC Tier-2 methodology (IPCC, 2006). Stakeholders comprising public extension workers, researchers, and representatives of NGOs along with FAO staff took part in the workshop where characterization of feeding systems were discussed, among other issues. Participants were divided into two groups based on similarities of the agro-ecological production systems of the regions where they were based. The first group included participants from Somali, Oromia and Southern Nations, Nationalities and People’s Regions (SNNPR), and the second group comprised participants from Afar, Amhara and Tigray. Tables 1 and 2 provide information on the results which emanated on characterization of feeding systems. Somali, Oromia and SNNPR. During the deyr/hagaya rainy season, pasture and browse regenerate. This improves the relative availability of forage for grazing and browsing animals. A couple of months following the deyr/hagaya season, livestock in the southern lowlands largely depend on enclosed and protected areas, parks, and deltas of river basins. Crop residues complement forage from natural vegetation in the places where the agro-pastoral system of production is practised. During the ganna/gu season, herds return to normal grazing areas and natural pasture and browse in the rangelands are the primary source of feed. In hagaa/bon-hagaya, limited internal movement of herds takes place. In a normal year, pasture regenerated in the preceding rainy season is sufficient for the season; crop residues and grazing in agro-pastoral areas contribute to feeding of livestock. Amhara and Tigray. During kiremt/karma season traditional feeding strategies include grazing on natural pastures, complemented by forage cut-and-carry system and reserved crop residues or cactus pads and fruits leftovers. In gilal/tseday, the long dry season, the main feeding strategy is livestock grazing on natural pastures and protected areas, and on crop aftermath. Crop residues are generally used to supplement livestock nutrition. In Tigray, cactus pads constitute an important source of feed, particularly during extended dry seasons. In the sugum/belg season, the livestock feeding strategies remain mostly the same as in the previous season, however with increased reliance on grazing of natural pastures. In hagay/bega, livestock rely on crop residues, preserved hay and purchased feed. Grazing on protected natural pastures on enclosed and protected areas also takes place. Afar. During the period from mid-June to mid-September (kiremt/karma season), the feed available includes local natural pastures, sometimes associated with migration to areas with low risk of diseases. In gilal/tseday, herders generally move with their animals to places where there is a reliable supply of forage and the climate is mild. Here again the common feeding strategy is natural pasture grazing. In certain areas, such as the banks of Awash River basin and the bordering highlands, the purchase of hay and crop residues is common. In others, grazing is complemented by fodder produced in backyards. However, production of fodder in backyards is generally limited. In belg/sugum, due to the frequent failure of rains, the common feeding strategy is migration within and outside the region in search of green forage. In hagay/bega season, pastoralists generally migrate to far areas in search of pastures, as a result of the shortages in their areas of origin. Somali, Oromia and SNNPR. In jilal/bona and hagaa/bon-hagaya seasons generally about 90% of feeding relies on natural pastures, while the remainder relies on feeding of crop residues or non-conventional feeds such as acacia pods. In the ganna/gu and deyr/hagaya seasons, livestock feeding completely relies on rangeland resources: pastures and browses and therefore rangeland health determines livestock productivity and production. Amhara and Tigray. In kiremt/karma and belg/sugum seasons generally more than 90% of the feeding depends on natural pastures and the remaining proportion comes from crop residues and some other supplements. But in the gilal/tseday and hagay/bega seasons the proportion of crop residues, crop aftermath, preserved hay and other supplements might increase, with different proportions across the two seasons. Afar. Since the main feed resource is rangelands, animals freely graze or browse on the forage available. However, in some areas supplementary feeding occurs in limited proportions, and priority is given to pregnant and lactating cows, and weak animals. Seasonality of agriculture production, inadequate natural pasture and cultivated fodder production, along with the inefficient use of available feed resources greatly impacts animals’ nutrition and subsequently their productivity. In arid and semi-arid lands, there is an acute shortage of feed. These shortages become further amplified during periods of drought. Some approaches to enhance biomass availability and their efficient use, identified through the workshop are presented below. The following may be read in conjunction with Makkar et al. (2018). Enhance use of high tannin browses in extreme drought by inactivating the incriminatory factor (tannins) present in browses using lick blocks containing polyphenol-inactivating compound (polyethylene glycol, molecular weight 4000). Establish fodder/feed banks near the drought prone areas to help contribute to the efficient utilization of available feed resources, decrease volatility in feed prices and prevent increase in feed cost during droughts. From the above analysis, it is evident that in the arid and semi-arid zones of Ethiopia the feeding strategies in dry seasons are largely dependent on naturally available forages, which include grazing pasture and browses. Crop residues and conserved hay, if available, are used in small amounts as supplements. During the rainy seasons the pasture availability and quality are high (Keba et al., 2013; Talore et al., 2013) and generally achieve satisfactory livestock productivity. In the dry seasons, the quality of grazing pastures is very poor, with digestibility of approximately 40% to 45% and crude protein content of less than 5% (Keba et al., 2013; Talore et al., 2013). The crop residues used as supplement are also low in crude protein (3% to 4%) (Feedipedia, 2018) - much lower than is required even for maintenance (7%). Also, such feed resources are deficient in minerals. Low quality of feed resources and insufficient availability of biomass result in low livestock productivity, and in drought situations extensive livestock mortality occurs. In addition, such low quality, fibre-rich and imbalanced diets result in high release of greenhouse gases (FAO, 2013). Opportunities exist to enhance the biomass availability and to increase the efficiency of available nutrients as identified in the workshop and listed in the previous sections. Concerted efforts by national and international development organizations, researchers, NGOs, feed industry and the national government would help in making the livestock production more efficient and more environment friendly by decreasing GHG emission. Livestock mortality can also be decreased during periods of drought. Through concerted efforts of the national Government sustainability of the improvement programmes will pave the way for sustainable livestock development. A sustainable livestock development is possible only if programmes and activities are led and driven by the local and national Governments. The role of international organizations should be seen as only that of a catalyst. We thank all participants of the workshop for providing input, which led to the development of this article. FAO provided financial assistance for organising the workshop, which is also gratefully acknowledged. We also thank Kara Jenkinson for her assistance in editing this article. CSA (Central Statistical Agency). 1998. Agricultural Sample Survey.1997/98. Bulletin 193, Vol. IV, CSA, Addis Ababa. pp. 561. CSA (Central Statistical Agency). 2015. Federal democratic republic of Ethiopia central statistics agency agriculture sample survey: report of livestock characteristics. Addis Ababa, Ethiopia. Damron, S.W. 2006. Introduction to Animal Science. 3 ed. Oklahoma State University: PEARSON prentice Hall, pp: 480-500. Eshetu, Z. and Opio, C. 2016. Improving MRV for Agricultural emission reduction in the livestock sector: Ethiopian Dairy Sector, 07 Nov, 2016. COP 22 Side Event, Mediterranean Room, Marrakech. Gebremariam S., Amare S., Derek Baker and Solomon A. 2010. Diagnostic study on live cattle and beef production and marketing: constraints and opportunities for enhancing the system, Addis Ababa, Ethiopia. 46p. Gelayenew B., Nurfeta A., Assefa G. and Asebe G. 2016. Assessment of Livestock Feed Resources in the Farming Systems of Mixed and Shifting Cultivation, Gambella Regional State, Southwestern Ethiopia. Global Journal of Science Frontier Research: Agriculture and Veterinary, Volume 16, Issue 5, Version 1.0. Keba, H.T., Madakadze, I.C. , Angassa, A. and Hassen, A. 2013. Nutritive value of grasses in semi-arid rangelands of Ethiopia: local experience based herbage preference evaluation versus laboratory analysis. Asian-Aust. J. Anim. Sci., 26 (3): 366-377. MoARD (Ministry of Agriculture and Rural Development) 2004. Livestock Development Master Plan Study. MoARD, Addis Ababa, Ethiopia. Payne, W.J.A. and Wilson, R.T. 1999. An Introduction to Animal Husbandry in the Tropics, pp. 154-174. Talore, D., Hassen, A., Kocho, T., Birhanu, T., Bassa,Z. and Jimma, A. 2013. Chemical Composition and Digestibility of Major Feed Resources in Mixed Farming System of Southern Ethiopia. World Appl Sci. J. 26(2) 267-275. USAID and GoE 2010. An Atlas of Ethiopian Livelihoods. The Livelihoods Integration Unit. A joint Government of Ethiopia and USAID Ethiopia Document. 2010.